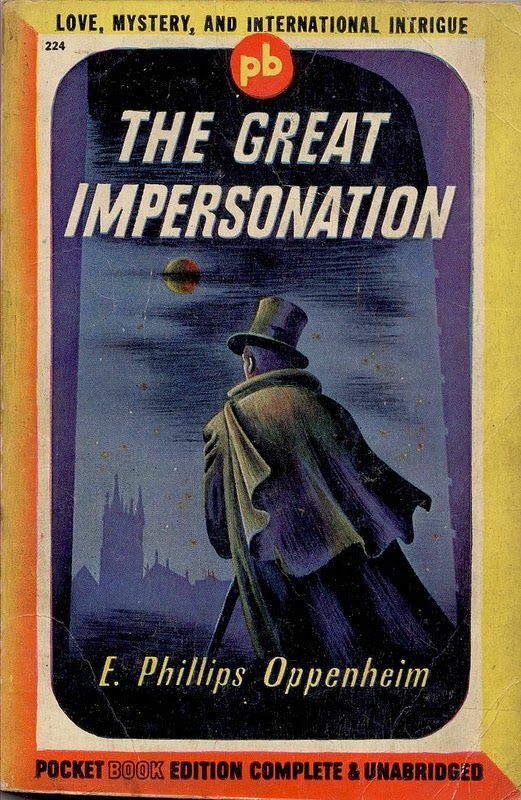 I don’t usually pay much attention to the recommendations that pop up on sites like Goodreads and Amazon (“as you liked that book, you might like this one”) but there have been one or two occasions where a particular recommendation has caught my attention, I’ve tried the book and enjoyed it – and that was what happened with The Great Impersonation! This novel by E. Phillips Oppenheim was apparently hugely successful on its publication in 1920, has been adapted for film three times and was included on The Guardian’s list of 1000 Novels Everyone Must Read, yet until now I had never come across the book and didn’t know anything about the author. It seems Oppenheim wrote a very impressive number of books – over 100, mostly thrillers, between 1887 and 1943. I’m not sure whether I’ll look for more of them, but I’m glad I read this one. The Great Impersonation opens in East Africa in 1913, just before the start of the First World War, and begins with an unexpected encounter between two men who once attended school and university together. One of them is thirty-six-year-old Everard Dominey, who fled England several years earlier following a scandal which arose when he was believed to have killed a man in a fight over his (Everard’s) wife, Rosamund. Since then, Everard has become a dissolute, disreputable drunk, wandering aimlessly from country to country with no direction or purpose in life. The other is Leopold von Ragastein, a German nobleman who has also been banished for duelling with and killing the husband of his lover, the Princess Eiderstrom. Everard and Leopold have always looked remarkably alike and still do, although the resemblance is not as strong as it used to be because of the very different lifestyles they have been leading. After a night spent drinking and confiding in each other the secrets of their pasts, we see Leopold hatching a plot to dispose of Everard in the desert so that he can steal his identity and undertake a spying mission for the German government. The Great Impersonation is very cleverly written so that, however much we may think we know the truth, we can never be quite certain. Everard/Leopold is always referred to as Everard, even in scenes where he is discussing his spying activities with his German contacts, who have no doubt that he is Leopold. The two men’s lovers, Rosamund and Princess Eiderstrom, cause even more confusion with Rosamund accusing Everard of not being Everard and the Princess claiming that he is Leopold, before changing her mind again! If they cannot identify the man they love, what chance does the reader have? Of course, I am not going to tell you what is revealed in the end, except that I guessed correctly (I had a 50% chance of that, I suppose). Bearing in mind that the book was published in 1920, I should mention that there is some racist language in the opening chapters set in Africa, but there is much less of this once the action moves back to Europe. I can also tell you that although this is described as a spy novel, there’s not a huge amount of spying in it, so if you’re not very interested in that sort of thing, there’s still some romance, the mistaken/stolen identity storyline, and also some gothic elements (mainly involving a possible ghost or demon that haunts the Black Wood near the Dominey estate). If anyone else has read this book, please let me know what you thought of it – and whether you can recommend any more of Oppenheim’s many novels. I’ve heard of Oppenheim but never read him, although I think it was in the context of GA crime, so maybe he did crime novels too? Sounds intriguing! He wrote such a lot of books I’m sure there must have been some crime novels amongst them. I’ll have to investigate! It’s a quick and entertaining read and I think it’s definitely worth adding to your wishlist! Huh! This one sounds interesting, and I haven’t ever head of it before, either. Yes, it’s an interesting, entertaining read. I’m glad it’s not just me who hadn’t heard of it! What a plot line! I have not read this author but I will be curious to read your reviews of any others you may read, especially if they were published from 1940-1943, which must have been his very last novels. I got the impression most of his books were thrillers and spy novels like this one, but maybe there were some mysteries amongst them as well. I will probably try another one at some point. That’s interesting. I haven’t heard of the Martin Guerre case, but yes, it seems likely that Oppenheimer might have read about it. Natalie Zemon Davis wrote the book, Janet Lewis wrote one about the wife, and Gerard Depardieu played the lead in the movie. It’s an interesting case, with a real life scene that seems to come out of fiction: the imposter has convinced the court he’s the Real Deal, and suddenly into the courtroom stalks the real Martin. I hadn’t heard of this either but it sounds really good, although I take your note that you wouldn’t necessarily read another one! I didn’t think the writing was anything special, but the plot was fun and kept me entertained. I probably will read another one eventually, although I think this was supposed to be his best. Yes, I’m pleased I spotted it in the recommendations otherwise I would probably never have thought to try it. Amazon has a high success rate with me when it recommends a book as I tend to check the customer ratings as well before I acquire it. Anyways, I like the sound of this mistaken identity novel. It kind of reminds me of another but I won’t identify the novel as it will spoil it big time. I’m curious that if you like this one, why you are not sure you want to read another work of his? Just wondering. I’ve read a few other novels about mistaken identities and doubles, but they haven’t been quite like this one. I probably would read another of Oppenheim’s books if I came across one as I did find it entertaining, but I felt that it was all plot with no real depth and I’m not in any hurry to read more at the moment.